Completed in the fall of 2011, this three year study evaluated the effectiveness of three underground stormwater infiltration systems constructed over fine-textured glacial till soils and draining runoff from industrial/commercial developments located in the Greater Toronto Area (GTA). Together with other STEP evaluations of infiltration practices (e.g. permeable pavements, bioretention cells and swales) this study helps address a significant gap in knowledge about the efficacy of these technologies for managing urban runoff on sites with low permeability, fine-textured glacial till soil which includes the majority of designated urban growth areas in the GTA. The runoff reduction performance of each system was examined relative to original design objectives. The systems monitored in Richmond Hill and Bolton treat roof drainage only and were designed to infiltrate a quantity of runoff equivalent to what would have infiltrated over the lot prior to development during an average year. The third system in Brampton treats both roof drainage and parking lot runoff and was designed for detention and controlled release of flows to a conventional storm sewer system with the opportunity for infiltration. Monitoring at the Brampton site examined whether or not such systems provide runoff reduction benefits in this context. The field monitoring programs included year-round measurements of precipitation depth at each site, water level in each system and where possible, flow rate and volume in the storm sewer receiving outflows. 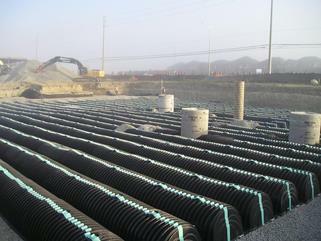 At the Richmond Hill site, the infiltration chamber system was found to be capable of infiltrating the volume of runoff it was meant to on an annual basis despite minor leakage, slower than expected drainage time and potential for the water table to interact with the base of the system in the spring. The infiltration trench system at the Bolton site was found to not be meeting its annual infiltration volume design objective due to leakage, slower than expected drainage times and small water storage capacity relative to the size of the roof drainage area. However, it was estimated that trenches with 1.9 to 4.5 times greater water storage capacity would be capable of meeting the objective. These findings are significant considering that infiltration practices are widely considered to have limited effectiveness on fine-textured soils. In the Brampton case, monitoring indicated that little or no runoff reduction benefit is being achieved by the chamber system, likely due to a perched water table. While it was not possible to confirm whether or not a perched water table exists, it highlights the importance of careful consideration of the underlying stratigraphy and water table elevation when deciding on suitability of a site for stormwater infiltration practices.